There is no typical day in Brazil. Everyday starts the same, the sun comes up at 4:30 a.m. and sets by 5:30 p.m. But in the middle, well, everything moves at a different pace than you might expect. Some mornings start with local children hanging out near the gate of the Chacara hoping some Americano will give them a treat. Finding children as young as two at the gate is a common experience. Most are early to mid elementary age. A few are older. We try not to give things right at the gate, because once word gets out, the numbers rapidly multiply. Instead, we give things out as we walk up and down the road, going to the small store or on the steps of the church built by Forest Park Baptist Church members. 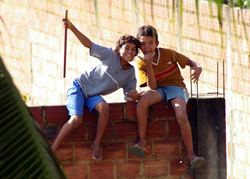 Some of the older children at the gate, and the boys living at the orphanage, want to practice their English with Americanos. One of my newest friends, Alan, likes to point out items and teach me the words in Portuguese. Then I repeat the name of the item in English. It’s slow, but it’s a fun way to learn a difficult language. Each day is different, because other than meal times, you never know what may come through the gate. Take Friday morning for example. As I sat down to journal, in drove a small car of Federal Police. I’ll admit, it’s not a common sight, and several of us wondered what might be up--until we saw Janete’s brother climb out of the car. He just wanted to visit his sister and daughter. 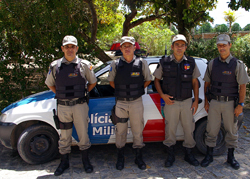 Before he left, the four officers posed for pictures for the Americano journalista. One even made sure his bullet-proof vest and hat were on just right. Later in the morning, Debbie, Janna and I needed to go to town to purchase supplies for Saturday’s family event at the church built by Forest Park --it’s just down the street. What might have been a short errand in America, took five and a half hours to complete. I said it in a previous blog, nothing is simple here and a trip to town includes numerous stops. You never know what you might find in Maceio. We stopped at the equivalent of an “everything’s a dollar” store in America. Except here, everything is $1.25 in Brazilian money. I guess they had to raise their prices, even though the sign still says $1 Real. The streets are also lined with a variety of signs and vendors. On one corner, we found someone had lined the sidewalk with shoes and purses for sale. 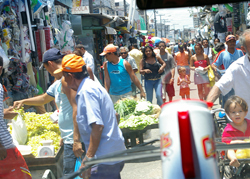 Another street in the city was lined on both sides with numerous stalls offering everything from fresh fruit to kitchen utensils. As we drove through the stalls, people continued to walk in the street. We literally crawled through the human traffic until we eventually got to the next intersection. To buy candy and other treats in bulk, we went to a Tabuleiro store. There we found boxes and bags of a variety of treats including the Brazilian version of popcorn. It’s also fun to “people watch” as you ride through the city. At one corner, while our driver was running an errand, we saw a group of older men playing dominos. At other places we saw children playing outside and riding bicycles. Life moves at a different pace in Brazil. For Ameicans, it takes some getting used to. If you learn to “go with the flow” it’s not bad. 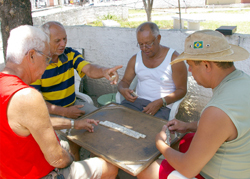 Older men play a game of dominos at one street corner in Maceio. Kaylea Hutson | JoplinDaily.com.